If the installer detects more than one possible device that could hold a driver update, it prompts you to select the correct device. 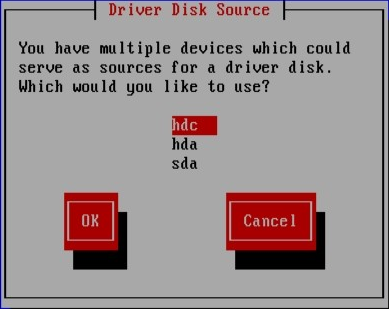 If you are not sure which option represents the device on which the driver update is stored, try the various options in order until you find the correct one. If the device that you choose contains no suitable update media, the installer will prompt you to make another choice. 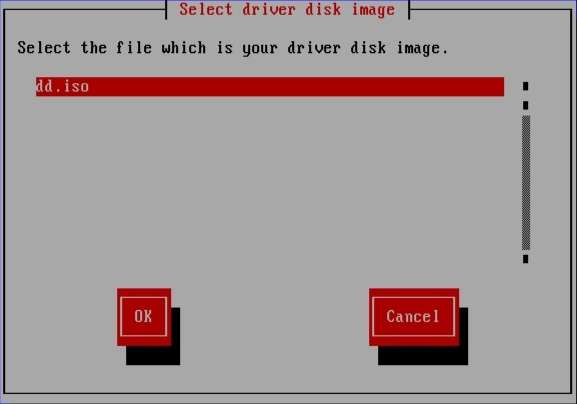 If you made a driver update disk on floppy disk, CD, DVD, or USB storage device, the installer now loads the driver update. 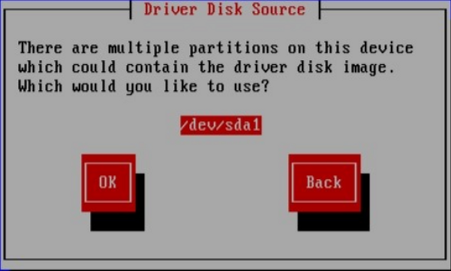 However, if the device that you selected is a type of device that could contain more than one partition (whether the device currently has more than one partition or not), the installer might prompt you to select the partition that holds the driver update. Expect to see these screens if you stored the driver update on an internal hard drive or on a USB storage device. You should not see them if the driver update is on a floppy disk, CD, or DVD. Regardless of whether you are providing a driver update in the form of an image file or with a driver update disk, the installer now copies the appropriate update files into a temporary storage area (located in system RAM and not on disk). The installer might ask whether you would like to use additional driver updates. If you select Yes, you can load additional updates in turn. When you have no further driver updates to load, select No. If you stored the driver update on removeable media, you can now safely eject or disconnect the disk or device. The installer no longer requires the driver update, and you can re-use the media for other purposes.